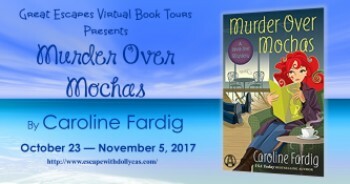 CAROLINE FARDIG is the USA TODAY BESTSELLING AUTHOR of the Java Jive Mysteries series and the Lizzie Hart Mysteries series. Fardig’s BAD MEDICINE was named one of the "Best Books of 2015" by Suspense Magazine. She worked as a schoolteacher, church organist, insurance agent, funeral parlor associate, and stay-at-home mom before she realized that she wanted to be a writer when she grew up. Born and raised in a small town in Indiana, Fardig still lives in that same town with an understanding husband, two sweet kids, two energetic dogs, and one malevolent cat. 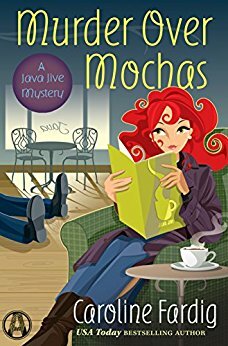 I’ve had the best time writing the Java Jive series, and a big part of that has been the researching I’ve done. Some might call it “vacationing,” but I call it “immersing myself in my story.” When I hit the streets of Nashville and imagine Juliet and the gang hanging out at their regular haunts, it makes me feel like I’m in the story. The first stop on any Java Jive tour of Nashville would have to be a coffeehouse. There are several, and my favorites are in the area just southwest of downtown, which is home to Vanderbilt and Belmont Universities and Music Row (all great places to visit, as they all are mentioned in the series). Next up would have to be Centennial Park, home of The Parthenon. The murder in Mug Shot, the second book in the series, happens in the park, so there are plenty of scenes there. Walking around the beautiful grounds is fun in itself, but The Parthenon is not to be missed. I’ve seen the real one in Greece, but this one is just as interesting and has a history all its own. No trip to Nashville would be complete without a walk down Broadway at night. Sure, you’ll be appalled by the swarms of drunken bridesmaids whooping it up at the numerous nightly bachelorette parties. But if you can get past that, Broadway is a really cool place to be. Loud, live music pours out of every open doorway up and down the main drag, and the food is unbelievable. The drinks aren’t bad, either, as long as you stay sober enough to dodge the many booze cruise pedal bars. If you’re a musician, you’ll love the vintage guitar stores dotting the town. The awesome thing is, you can go in and play for as long as you want on nearly any guitar you want—old and new, big and small, electric and acoustic. I could have made an entire day out of it, but my non-guitar playing kids were ready to move on, especially since pancakes were promised. The crown jewel of Hillsboro Village is the Pancake Pantry, and it has been for decades. Juliet goes on a lunch date there in Death Before Decaf and talks fondly about how many orders of pancakes she’d consumed during her college career. My son (a true pancake connoisseur) asked me one day this summer if we could make the 2+ hour drive to Nashville just to get some pancakes there. The reasoning might have been frivolous, but sharing a town like Nashville with the ones you love is always worth it.